The famous millionaire oil man/aviator/filmmaker was much in the news in 1946. 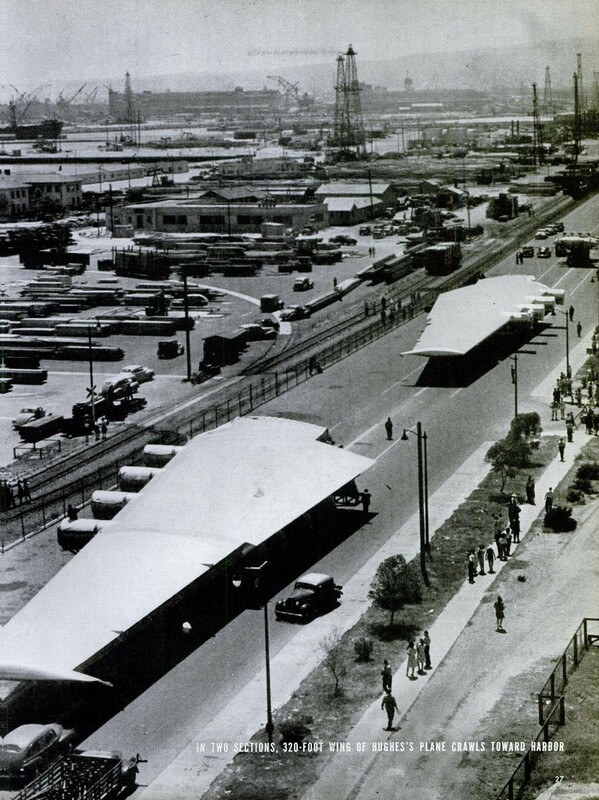 In late March 1946, construction for the graving dock for the World’s Largest flying boat, the Hercules, or H-4 as it was less romantically known, got underway at Terminal Island in Los Angeles Harbor. Built of wood (birch, actually, not spruce) and said to be capable of transporting around 60 tons of cargo or 700 troops, it had cost a reported $20,000,000. A few days later, on April 2, Hughes’ long-awaited film, The Outlaw, opened in Los Angeles theaters. Crowds of the curious lined up at each of the city’s four Music Hall theaters. The Outlaw opening day, 4/3/46. Both projects had been kicking around since 1942. 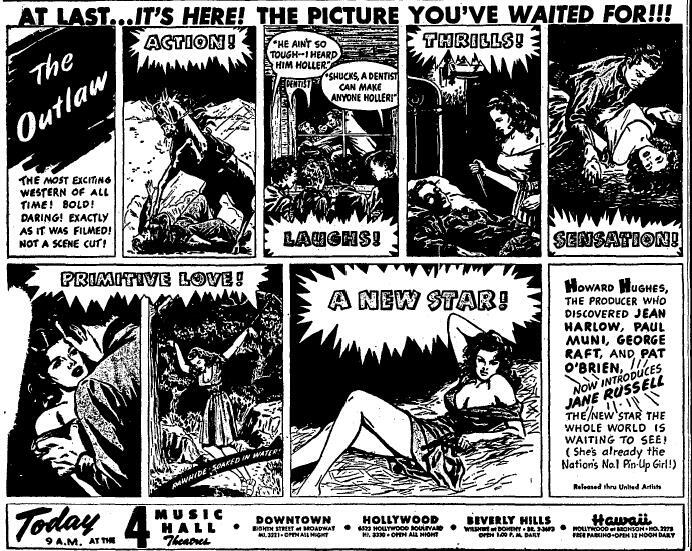 That was the year Hughes completed The Outlaw, which was to have introduced Hughes “discoveries” Jane Russell and Jack Buetel. It premiered at the Geary Theater in San Francisco February 1943 but Hughes thereafter held the film back from general release, ostensibly over interference by censors. Hughes had been involved in films since the late 1920s and was no stranger to battles with censors. In 1932, his gangster picture Scarface had been banned in certain cities like New York and Chicago for its violence. Scarface proudly shown in Los Angeles in 1932, like The Outlaw “uncut and uncensored.” The screenplay was written by W.R. Burnett (whose 1929 novel Little Caesar was made into a gangster film of the same name in 1931). 1942 was also the year shipbuilder Henry Kaiser and Hughes teamed up to produce military transport planes, with an $18,000,000 appropriate from the federal governments Reconstruction Finance Corporation. Kaiser, who was now involved in housing projects with Fritz Burns and auto production, had pulled out of the project in 1944, the project uncompleted. Hughes continued alone, with authorization from the War Production Administration to build one example, which was finally, in 1946, ready to prepare for test flights. That itself was a massive undertaking. Getting it from the Hughes Aircraft plant to the graving dock in the harbor involved strengthening bridges and adjusting multiple power lines along the 28-mile route. The two wings-160 feet long and 50 feet at their widest point- and the 220-foot long hull, were moved in three sections, using house-moving dollies, between June 10 and June 11, 1946. 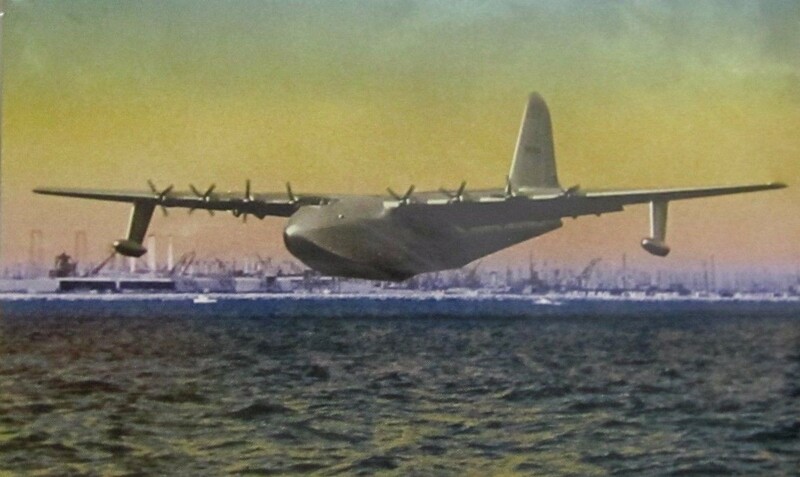 By the time this photo of Hercules’ wings nearing the Harbor appeared in Life’s 7/8/46 issue, the plane’s creator was in the hospital, clinging to life. 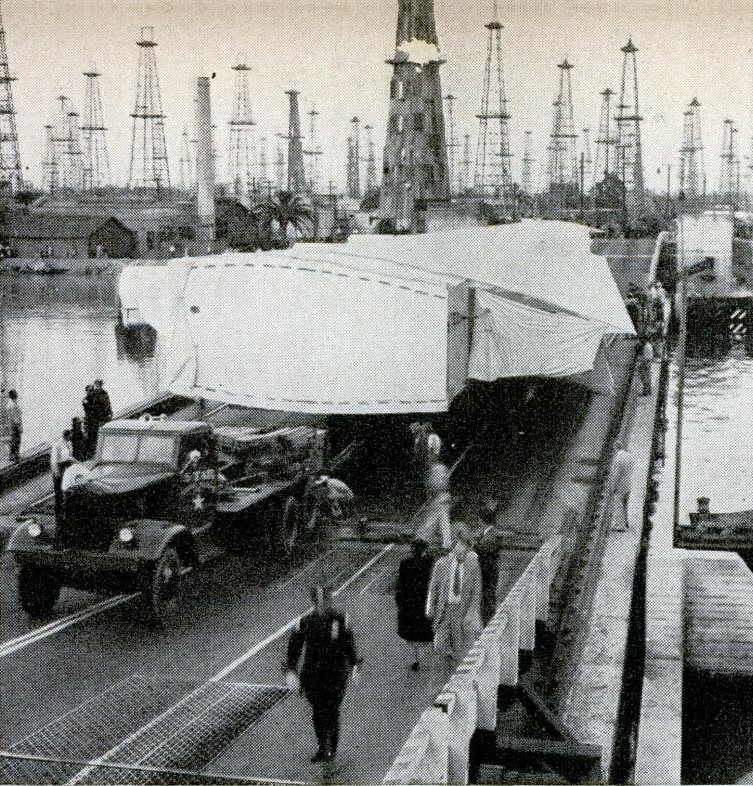 Transporting one of Hercules’ wings across the pontoon bridge to Terminal Island. The bridge opened in June 1944 to serve the naval base on the island. Popular Science, August 1946. Moving the hull. Popular Science, August 1946. On July 5, local journalists got a “sneak peek” of the partly assembled Hercules. With a wing tip-to-wing tip span of 320 feet, it was hard to keep under wraps. Two days later, at 5:25 pm, before an assembled crowd or reporters and associates, Hughes an experienced aviator, having set multiple air speed records in the 1930s, took off on a solo flight from Culver City in another experimental aircraft, the XF-11 photo reconnaissance plane he’d been building for the Army Air Forces. 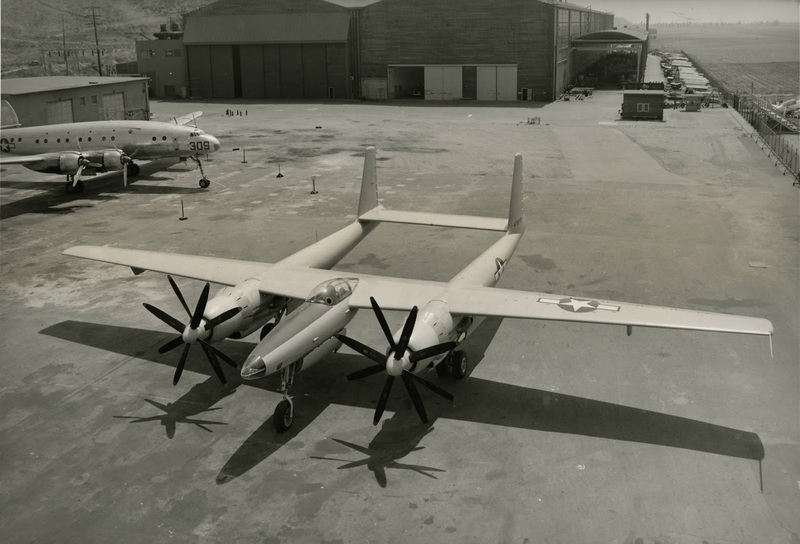 One hour and 18 minutes later the XF-11 was a burning wreck. 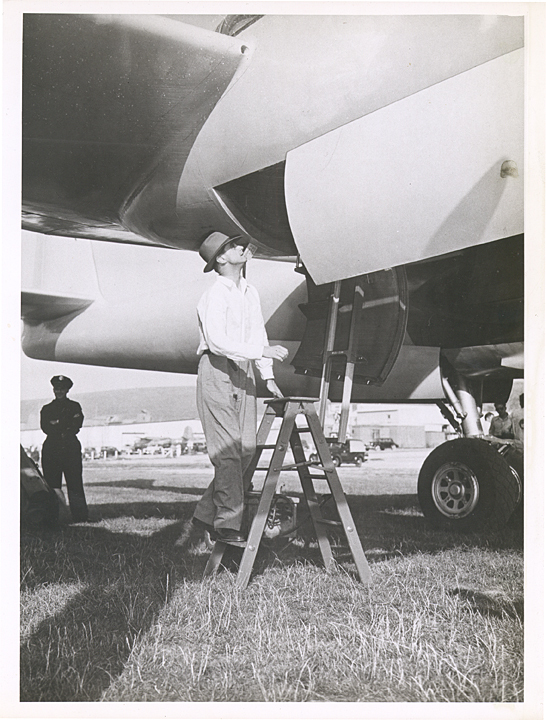 Hughes preparing to board the XF-11 prior to its test flight on 7/6/46. Hughes built a second XF-11 prototype, seen here in 1947. An undetected leak in one of the engines had caused it to fail over Beverly Hills. Hughes appears to have tried to land the craft on the green of the Los Angeles Country Club golf course but didn’t make it. The XF-11 took the roof off the home of Dr. Jules Zimmerman at 803 N. Linden Drive, then the right wing sliced through a bedroom of 805 N. Linden, home of Jerry and Elizabeth De Kamp. 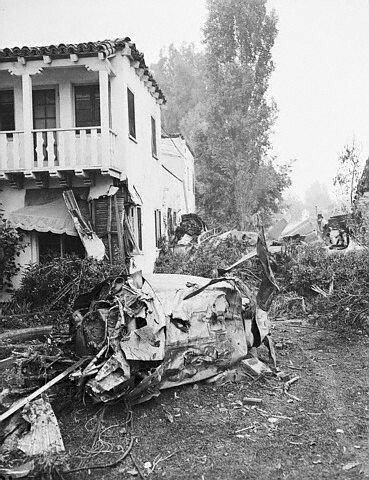 It then skimmed along a row of poplar trees bounding the rear of Col. Charles Meyer’s residence 808 Whittier Dr. and crashed into the home. An engine from the plane slammed into the home of Gosta and Katherine Guston next door at 810 Whittier. The Guston’s son, Capt. James Guston, recently discharged from the Army, and Marine Sgt. William Lloyd Durkin pulled Hughes from the wreckage before it burst into flames. A broken gas main also sent flames shooting 80 feet into the air. The fire department, battled the conflagration for three hours. Fortunately no one inside the residences was killed or seriously injured. 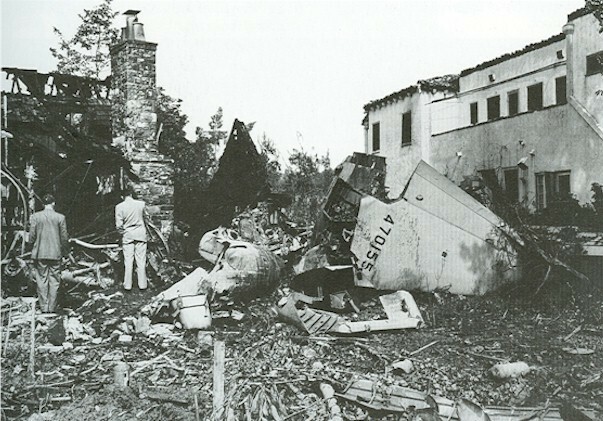 The Meyer home was almost completely destroyed. Hughes was rushed to Beverly Hills Emergency Hospital with burns and multiple critical injuries. Later transferred to Good Samaritan, Hughes left the hospital on August 12 to recuperate in private. 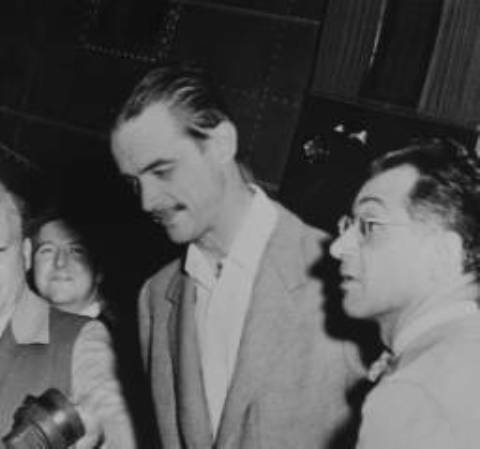 By September 10 he had recovered sufficiently to fly himself east to New York to face the Motion Picture Association over censorship related to The Outlaw. Hughes, sporting a post-crash mustache, in New York. UNLV. 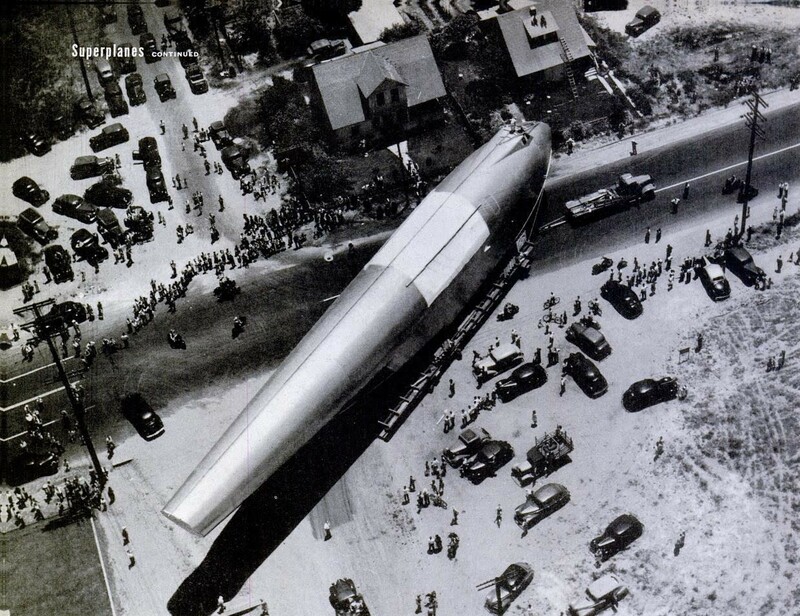 The Hercules “world’s largest plane” was a must-see for Harbor tourists in 1946. In 1947 the Senator Ralph Owen Brewster (R-ME) led Senate War Investigating Committee, primarily intent on besmirching the late President Franklin D. Roosevelt, son Elliott Roosevelt, and Hughes, launched a probe into the government contracts for the Hercules and the XF-11. In his hours-long public testimony, Hughes in turn lodged that Brewster had taken contributions from Juan Tripp, president of Pan American Airways, chief competition of the Hughes-controlled TWA. The SWIC disbanded without making a report. The Hercules did make a brief but successful test flight, on November 2, 1947 with Hughes himself at the controls. The Army and Navy passed, however, and the big ship never flew again. Hughes later built a temperature-controlled enclosure for it. After his death in 1976, the Hercules, better known by its press-given nickname “Spruce Goose,” would be put on public view in Long Beach. It is now exhibited at the Evergreen Aviation & Space Museum in Oregon. The Outlaw, in spite of, or perhaps because of, Hughes’ ultimately successful battles with the censors, played in LA theaters for the rest of the year, eventually from the Music Hall theaters to the Marcal on Hollywood Boulevard. Hughes brought it back in 1948, the year he bought a controlling interest in R.K.O for an encore run.